Competition is generally considered as a positive driving force in many sectors as it enhances efficiency and promotes innovation. In the financial sector, countries are implementing reforms that increase competition. This study aims to examine the relationship between competition and financial soundness employing Panel ARDL pooled mean group (PMG) estimations in 16 emerging countries’ banking sectors for 1996-2015 periods. Results show that competition and financial soundness are moving together in the short and long-run. Also, it is found that competition has a negative effect on financial soundness in the short and long-run. Findings tend to support “competition-fragility” approach in emerging country banking sectors. Rekabet, çoğu sektörde verimliliği arttırdığı ve yeniliği teşvik ettiği için genellikle itici bir güç olarak kabul edilmektedir. Finans sektöründe de ülkeler rekabeti arttırıcı reformlar gerçekleştirmektedir. Bu çalışmada, 1996-2015 dönemi için 16 gelişmekte olan ülke bankacılık sektöründe, Panel ARDL havuzlanmış ortalama grup (PMG) tahmincisi kullanılarak, rekabet ile mali sağlamlık arasındaki ilişkinin incelenmesi amaçlanmıştır. Sonuçlar, rekabetin ve mali sağlamlığın hem uzun dönemde hem de kısa dönemde birlikte hareket ettiğini ortaya koymuştur. Ayrıca rekabetin uzun ve kısa dönemde finansal sağlamlık üzerinde negatif bir etkisi olduğu tespit edilmiştir. Elde edilen bulgular gelişmekte olan ülke bankacılık sektörlerinde “rekabet-kırılganlık” görüşünü destekler niteliktedir. Abbasoğlu, Osman; Furkan, Ahmet; Faruk Aysan; Güneş Ali (2007), “Concentration, Competition, Efficiency and Profitability of the Turkish Banking Sector in the Post-Crisis Period”, MPRA Working Paper, No: 5494: 1-23. Ağırman, Ensar; Özcan, Muhammet; Yılmaz, Ömer (2014), “Terörizmin Finansal Piyasalara Etkisi: Ampirik Bir Çalışma”, BDDK Bankacılık ve Finansal Piyasalar, Cilt. 8, Sayı. 2: 99-117. Angelini, Paolo; Cetorelli, Nicola (1999), “Bank Competition and Regulatory Reform, The Case of The Italian Banking Industry”, Working Paper, Research Department, WP-99-32. Federal Reserve Bank of Chicago, December. Apergis, Nicholas; Polemis, L. Michael (2016), “Competition and Efficiency in the MENA Banking Region: A Non-Structural DEA Approach”, Applied Economics, Vol. 48, No. 54: 5276-5291. Apriadi, Intan; Sembel, Roy; Santosa, Perdana, Wahyu; ve Firdaus, Muhammad (2016), “Banking Fragility in Indonesia: A Panel Vector Autoregression Approach”, IJABER, Vol. 14, No. 14: 1193-1224. Arrawatia, Rakesh; Misra, Arun; Dawar, Varun (2015), “Bank Competition and Efficiency: Empirical Evidence from Indian Market”, International Journal of Law and Management, Vol. 57, No. 3: 217-231. Asongu, Simplice; Ghassen, El Montasser; Hassen, Toumi (2016), “Testing the Relationships between Energy Consumption, CO2 Emissions, and Economic Growth in 24 African Countries: A Panel ARDL Approach”, Environmental Science and Pollution Research, Vol. 23, No.7: 6563-6573. Baltagi, Badi H; Feng, Qu; Kao, Chihwa (2012), “A Lagrange Multiplier test for Cross-Sectional Dependence in a Fixed Effects Panel Data Model”, Journal of the Econometrics, Vol. 170: 164-177. Beck, Thorsten; Olivier De Jonghe; Schepens, Glenn (2013), “Bank Competition and Stability: Cross-Country Heterogeneity”, Journal of Financial Intermediation, Vol. 22, No. 2: 218-244. Berger, Allen, N.; De Young, Robert (1997), “Problem Loans and Cost Efficiency in Commercial Banks”, Journal of Banking and Finance, Vol. 21: 849-870. Berger, Allen, N.; Hannan, Timothy (1998), “The Efficiency Cost of Market Power in the Banking Industry: A Test of the "Quiet Life" and Related Hypotheses”, The Review of Economics and Statistics, Vol. 80, No. 3: 454-465. Berger, Allen N.; Leora, F. Klapper; Turk-Ariss, Rima (2009), “Bank Competition and Financial Stability”, Journal of Financial Services Research, Vol. 35, No. 2: 99-118. Besanko, David; Thakor, Anjan (1993), “Relationship Banking, Deposit Insurance and Bank Portfolio Choice in: Mayer, C., Vives, X. (Eds. ), Capital Markets and Financial Intermediation”, Cambridge University Press, Cambridge, UK. Bildirici, Melike, Elif; Kayıkçı, Fazıl (2013), “Effects of Oil Production on Economic Growth in Eurasian Countries: Panel ARDL Approach”, Energy, Vol. 49: 156-161. Bofondi, Marcello; Gobbi, Giorgio (2004), “Bad Loans and Entry into Local Credit Markets”, Temi di Discussione del Servizio Studi #509. Bank of Italy. Boubaker, Sabri; Jouini, Jamel (2014), “Linkages between Emerging and Developed Equity Markets: Empirical Evidence in the PMG Framework”, The North American Journal of Economics and Finance, Vol. 29: 322-335. Boyd, John, H.; De Nicoló, Gianni (2005), “The Theory of Bank Risk Taking and Competition Revisited”, The Journal of Finance, Vol. 60, No. 3: 1329-1343. Breusch, Trevor; Pagan, Adrian (1980), “The Lagrange Multiplier Test and its Application to Model Specification in Econometrics”, Review of Economic Studies, Vol. 47: 239-253. Casu, Barbara; Girardone, Claudia (2009), “Testing the Relationship between Competition and Efficiency in Banking: A Panel Data Analysis”, Economics Letters, Vol. 105, No. 1: 134-137. Chen, Xiaofen (2007), “Banking Deregulation and Credit Risk: Evidence from the EU”, Journal of Financial Stability, Vol. 2: 356-390. Chirwa, Themba, G. (2018), “The Determinants of Public Debt in the Euro Area: A Panel ARDL Approach”, Working Paper. Cuestas, Juan Carlos, Yannick, Lucotte; Reigl, Nicolas (2017), Banking Sector Concentration, Competition and Financial Stability: The Case of the Baltic Countries (No. wp2017-7). Bank of Estonia. Demirguc-Kunt, Asli; Enrica, Detragiache; Tressel, Thierry (2006), “Banking on the Principles: Compliance with Basel Core Principles and Bank Soundness”, IMF Working Paper WP/06/242, Washington, D.C.: International Monetary Fund. Demsetz, Harold (1973), “Industry Structure, Market Rivalry, and Public Policy”, Journal of Law and Economics, Vol. 16: 1-9. Demsetz, Rebecca; Saidenberg, Marc; Strahan, Philip (1996), “Banks with Something to Lose: The Disciplinary Role of Franchise Value”, FRBNY Economic Policy Review October, 1-14. Dima, Bogdan, Marius Sorin Dincă; Spulbăr, Cristi (2014), “Financial Nexus: Efficiency and Soundness in Banking and Capital Markets”, Journal of International Money and Finance, Vol. 47: 100-124. Dumitrescu, Elena-Ivona; Hurlin, Chrristophe (2012), “Testing for Granger Non-Causality in Heterogeneous Panels”, Economic Modelling, Vol. 29, No. 4: 1450-1460.Dünya Bankası, http://www.worldbank.org/en/publication/gfdr/data/global-financial-development-database, 02.04.2018. Fu, Xiaoqing Maggie; Yongjia, Rebecca, Lin; Molyneux, Philip (2014), “Bank Competition and Financial Stability in Asia Pacific”, Journal of Banking & Finance, Vol. 38: 64-77. Hausman, Jerry (1978), “Specification Tests in Econometrics”, Econometrica, Vol. 46: 1251-1271. Im, Kyung So; Pesaran, M. Hashem; Shin, Yongcheol (2003), “Testing for Unit Roots in Heterogeneous Panels”, Journal of Econometrics, Vol. 115: 53-74. İskenderoğlu, Ömer; Tomak, Serpil (2013), “Competition and Stability: An Analysis of the Turkish Banking System”, International Journal of Economics and Financial, Vol. 3, No. 3: 752-762. Jimenez, Gabriel; Lopez, Jose; Saurina, Jesus (2013), “How Does Competition Affect Bank Risk-taking?”, Journal of Financial Stability, Vol. 9, No. 2: 185–195. Kasman, Adnan; Kasman, Saadet (2016), “Bank Size, Competition and Risk in the Turkish Banking Industry”, Empirica, Vol. 43, No. 3: 607-631. Keeley, Michael (1990), “Deposit Insurance, Risk and Market Power in Banking” American Economic Review, Vol. 80: 1183-1200. Korkmaz, Özge; Erer, Deniz; Erer, Elif (2016), “Bankacılık Sektöründe Yoğunlaşma İle Finansal Kırılganlık Arasındaki İlişki: Türkiye Örneği (2007-2014)”, Journal of Accounting & Finance, Cilt. 69: 127-146. Kouki, Imen; Al-Nasser, Amjad (2017), “The Implication of Banking Competition: Evidence from African Countries”, Research in International Business and Finance, Vol. 39, Part B: 878- 895. Kwan, Simon; Eisenbeis, Robert (1997), “Bank Risk, Capitalization, and Operating Efficiency”, Journal of Financial Services Research, Vol. 12: 117-131. 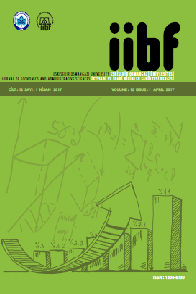 Leroy, Aurélien; Lucotte, Yannick (2017), “Is There a Competition-Stability Trade-Off in European Banking?”, Journal of International Financial Markets, Institutions and Money, Vol. 46: 199-215. Levin, Andrew; Chien-Fu Lin; Chu, Chia-Shang James (2002), “Unit Root Tests in Panel Data: Asymptotic and Finite-Sample Properties”, Journal of Econometrics, Vol. 108: 1-24. Maudos, Joaquı́n; De Guevara, Juan Fernandez (2004), “Factors Explaining the Interest Margin in the Banking Sectors of the European Union”, Journal of Banking & Finance, Vol. 28, No. 9: 2259-2281. Mercieca, Steve; Schaeck, Klaus; Wolfe, Simon (2007), “Small Banks in Europe: Benefits from Diversification?”, Journal of Banking and Finance, Vol. 31: 1975-1998. Özcan, Abdulvahap; Çiftçi, Cemil (2015), “Türkiye’de Mevduat Bankacılığında Yoğunlaşma ve Kârlılık İlişkisi (2006-2013 Dönemi)”, Ömer Halisdemir Üniversitesi İktisadi ve İdari Bilimler Fakültesi Dergisi, Cilt. 8, Sayı. 3: 1-12. Padoa-Schioppa, Teo (2001), “Competition and Supervision in the Banking Industry: A Changing Paradigm?”, European Finance Review, Vol. 5: 1-5. Pagano, Marco (1993), “Financial Markets and Growth: An Overview”, European Economic Review, Vol. 37: 613-622. Pedroni, Peter (1999), “Critical Values for Cointegration Tests in Heterogeneous Panels with Multiple Regressors”, Oxford Bulletin of Economic Statistics, Vol. 61: 653-670. Pesaran, M. Hashem; Shin, Yongcheol; Smith, Ron (1999), “Pooled Mean Group Estimation of Dynamic Heterogeneous Panels”, Journal of the American Statistical Association, Vol. 94, No. 446: 621-634. Pesaran, M. Hashem (2004), General Diagnostic Tests for Cross Section Dependence in Panels. University of Cambridge, Faculty of Economics, Cambridge Working Papers in Economics No. 0435. Pesaran, M. Hashem (2007), “A Simple Panel Unit Root Test in the Presence of Cross-Section Dependence”, Journal of Applied Econometrics, Vol. 22, No. 2: 265-312. Petersen, Mitchell; Rajan, Raghuram (1995), “The Effect of Credit Market Competition on Lending Relationships”, The Quarterly Journal of Economics, Vol. 110: 407-443. Beighley, H. Prescott; McCall; S. Alan (1975), “Market Power and Structure and Commercial Bank Installment Lending”, Journal of Money, Credit, and Banking, Vol. 7, No. 4: 449-467. Repullo, Rafael (2004), “Capital Requirements, Market Power, and Risk-Taking in Banking”, Journal of Financial Intermediation, Vol. 13: 156-182. Salas, Vicente; Saurina, Jesus (2003), “Deregulation, Market Power and Risk Behavior in Spanish Banks”, European Economic Review, Vol. 47: 1061-1075. Schaeck, Klaus; Cihák, Martin (2008), “How Does Competition Affect Efficiency and Soundness in Banking? New Empirical Evidence”, Working Paper. Schaeck, Klaus; Martin, Cihák; Wolfe, Simon (2006), “Are More Competitive Banking Systems More Stable?”, IMF Working Paper, WP/06/143, Washington, D.C.: International Monetary Fund. Shaffer, Sherril (1993), “A Test of Competition in Canadian Banking”, Journal of Money, Credit, and Banking, Vol. 25: 49-61. Taşkın, Dilvin (2014), “Türk Bankacılık Sektöründe Finansal İstikrar-Rekabet İlişkisi”, Maliye Finans Yazıları, Cilt. 103: 175-204. Tunay, Batu (2009), “Türk Bankacılık Sektöründe Rekabet ve Kırılganlık”, Bankacılar Dergisi, Cilt. 68: 30-56. Turk, Rima (2010), “On the Implications of Market Power in Banking: Evidence from Developing Countries”, Journal of Banking & Finance, Vol. 34, No. 4: 765-777. Westerlund, Joakim (2007), “Testing for Error Correction in Panel Data”, Oxford Bulletin of Economics and Statistics, Vol. 69, No. 6: 709-748. Wheelock, David, C.; Wilson, W. Paul (1995), “Explaining Bank Failures: Deposit Insurance, Regulation, and Efficiency”, Review of Economics and Statistics, Vol. 77: 689-700. Williams, Jonathan (2004), “Determining Management Behaviour in European Banking”, Journal of Banking and Finance, Vol. 28: 2427-2460. Yağcılar, Gamza, Göçmen (2011), Türk Bankacılık Sektörünün Rekabet Yapısının Analizi, BDDK Kitapları No: 10, ISBN(Web):978-975-9004-14-9, Ankara. Yaldız, Elmas; Bazzana, Flavio (2010), “The Effect of Market Power on Bank Risk Taking in Turkey”, Financial Theory and Practice, Vol. 34, No. 3: 297-314. Yeyati, Eduardo Levy; Micco, Alejandro (2007), “Concentration and Foreign Penetration in Latin American Banking Sectors: Impact on Competition and Risk”, Journal of Banking and Finance, Vol. 31: 1633-1647.